Caesium (or cesium) is the chemical element with the atomic number 55 on the periodic table. Its symbol is Cs. Caesium is an alkali metal. Its melting point is low (28 °C). It is extremely reactive. Because of its high reactivity, it is a dangerous chemical. It may set itself on fire (ignite) in air. It explodes on contact with water. It reacts more violently than the other alkali metals with water. Because of this, caesium is stored in mineral oil. 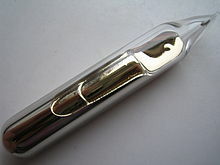 Caesium is a rare element. Since there is little caesium on the Earth, it is rather expensive. The human body does not need caesium. In large amounts, it is mildly poisonous because it is close to potassium, which the body does need. Caesium was first described in 1861, by Gustav Robert Kirchhoff and Robert Wilhelm Bunsen. They were testing mineral water, from Bad Dürkheim. After they separated calcium, strontium, magnesium and lithium, they saw two lines in the "blue" range of the spectrum. Because of these lines, they concluded that in addition to the elements already found, there must be another unknown substance in the mineral water. They named this substance caesium, after the color blue. Caesium has at least 39 known isotopes ranging in atomic mass from 112 to 151. Only one of these, 133Cs, is stable. Therefore, the naturally-occurring isotope of caesium is 133Cs, which is not radioactive. 133Cs is used in atomic clocks, its vibration frequency used to define the length of the second. Another isotope, 137Cs is not made naturally but is made after nuclear fission has been done. It is very radioactive and used as an industrial gamma ray source. Caesium forms compounds with many other chemical elements. Caesium formate is used in oil drilling because of its high density. ↑ Haynes, William M., ed. (2011). CRC Handbook of Chemistry and Physics (92nd ed.). Boca Raton, FL: CRC Press. p. 4.121. ISBN 1439855110. ↑ 3.0 3.1 Dye, J. L. (1979). "Compounds of Alkali Metal Anions". Angewandte Chemie International Edition 18 (8): 587–598. doi:10.1002/anie.197905871. ↑ William C. Butterman et al 2004. "Mineral Commodity Profile: Cesium" (PDF). United States Geological Survey. Retrieved 2009-12-27. ↑ G. Kirchhoff, R. Bunsen: Chemische Analyse durch Spectralbeobachtungen. In: Annalen der Physik und Chemie. 1861, 189, 7, S. 337–381 (doi:10.1002/andp.18611890702). This page was last changed on 14 January 2019, at 18:54.